This is very interesting. Please note that I use an arithmatic scale and not a log scale. 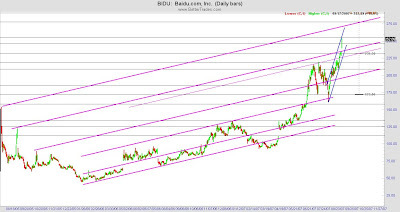 My original graph had the 3 bottom trend lines. I decided to replicate the lines and extend them. What is interesting is the highs in the 9/2005 correspond with those just a few days ago - same angle of attack. 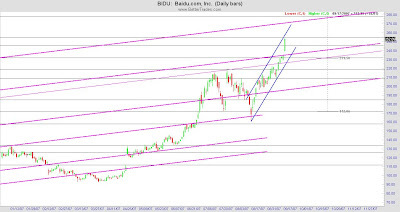 It would stand to reason that for the high at the beginning of when BIDU began in 8/2005, $272 may be a significant resistance over the next few days. This is a closer view of the prior graph. RSI & MACD show further bullish move. No bearish divergence yet. 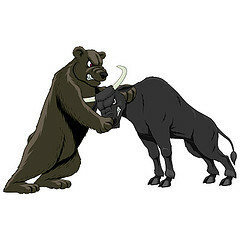 Cashflow & momentum are very bullish. Everything else - Moving Averages, Parabolic Sars, CCI, Bollinger Bands are all very bullish. These are just confirmations of what I already see in the price graph.